Vision: the experience of seeing someone or something in a dream or trance state. Mystic Visions Oracle Deck is a deck of internal discovery and through that discovery a tool to visualize and connect with the Divine. In this deck you will find a combination of affirmations, answers to direct questions and messages of guidance from the Divine. This deck asks for contemplation, visualization and action. Each of the 44 cards in this deck contains a unique watercolor illustration created by Alicia Cubbage, Mystic Visionary / Intuitive Artist, along with written messages that were inspired and fueled by Alicia’s own mystic journey. These are available for shipping or you can pick up in Keene, NH or Peterborough NH! If you choose the Pick Up option you will be emailed to scheduled a time and location for your pick up. Scroll Down for Card Layouts, How to consecrate your deck, how to store your cards and more! This is a spread for internal discovery. Use this spread when you have time to be present and receive the messages of the Divine. This is a spread for connecting with yourself and getting to know yourself better. You are seeking the truth of who you are and with proper time and contemplation you will find it. 1. Body: A message about the physical state of your body at this time and what you can do to strengthen your connection to Source. 2. Emotions: your emotional state and how it is affecting you right now. 3. Mind: your subconscious thoughts, things you may not be aware of that are part of your current Truth. 4. Spirit: your higher self, your soul and the current state it is in. 5. Strength/Gift: This is a strength or gift you have, and innate ability that is your responsibility to share with the world. 6. Learn: What you need to learn to continue growing and move forward on your path. 7. Divine Knowledge: What the Divine love of the Universe wants you to know and use on your journey. 8. Path Ahead: What lies before you on your path to inner truth. This is a spread for receiving guidance on a specific situation or person. 1. Past: The background and past influences of the current situation. 2. Present: The situation and it’s influences as it stands right now. 3. Future: The resolution or outcome of this situation if nothing changes. One Card Reading: this is a great reading when you are looking for a direct answer to a question. Concentrate on your question while you shuffle and turn over one card, this is your answer. Daily Practice Reading: A daily practice reading is a reading to add to your meditation practice. When you are ready to begin your meditation session, draw one card from the deck and set it in front of you where you can see it. Meditate and contemplate on the message the card brings you that day. Your Mystic Vision Oracle Cards have been cleared with a crystal and sage clearing ceremony upon arriving from the factory. However, they still need to be instilled with your personal energy and intentions. This is called entrainment; your cards will come into alignment with your own personal energy and work with you as you use them. If your cards ever stop delivering clear messages it is time to re-consecrate your deck. Begin by holding your deck between both hands and shuffling slowly. Let your entire body relax and feel the energy of your cards. Continue shuffling until you feel a connection. Hold the cards in your hands and bring them to your heart, then your lips and your head. Do this while breathing in deep and feeling the energy of the cards wash over you, then breath out and feel your energy wash over your cards. Now bring your cards to your third eye and ask for clear messages and visions. Bring your deck back to your heart and feel your connection to Divine Love. Your cards are sensitive tools that are affected by the energy around them. You can keep them in the box they came in or find a velvet pouch, special wooden box or other chosen container to keep them safe. You may place them upon your altar so they can absorb the healing energy there. You can also place a clear quartz crystal on top of them to protect them from un wanted energy and to clear the energy after every use. Begin each card reading by clearing the space and setting the tone. Mystic Visions is a deck for connection, contemplation and internal discovery. Make sure that your environment is free of distractions and unwanted energy. Begin by thinking about and/or visualizing your question or request. Ask for clear messages and connection from your guides, angels or the Divine (whichever you prefer). Shuffle the cards while you continue to think about and/or visualize your question or request. Stop shuffling when you feel guided to. You cannot stop shuffling at the wrong time, when you stop it is the right time. Place the deck on your reading surface, then pull cards from the top of the deck and lay them down face up in the order and formation of the reading layout you are using. Ask the person to state their question or request. Think about and/or visualize this persons’ question or request while you shuffle the deck. Stop shuffling when you feel guided to and place the cards face up in the order and formation of the layout you are using. If the cards that come up do not seem to relate or resonate with the person ask them if there is an underlying question or situation that they are truly concerned about. The cards will address what is truly concerning us rather what we ask about. For example; someone may be asking about job security when their true concern is their relationships and love life. The cards will recognize and pinpoint their resistance to forgiveness and the shutting down of their heart. Jumping cards are cards that seem to jump out of the deck when you are shuffling normally. When this happens set the card aside and include in them your reading after you have drawn the other cards in your chosen layout. 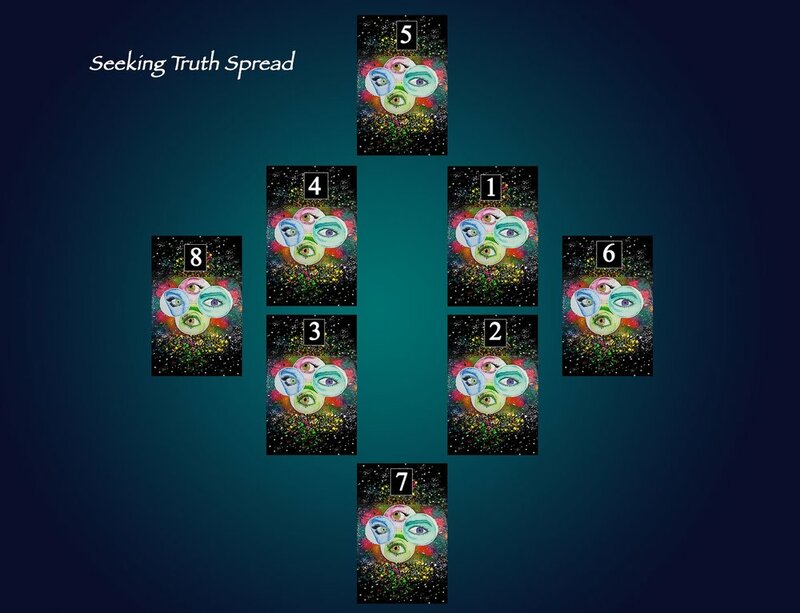 These cards are important messages specific to your inquiry or current situation. Your guides, angels or higher-self may be trying to tell you something. Look closely at a jumping card, pay attention to how you feel when you read it’s message. Does anything pop into your mind? Do you hear words, see images or feel sensations that give you insight to the reason for this message? These are important messages that need your attention. If you decide to, you can shuffle your deck by mixing the cards on a table top causing some of them to be upside down. In traditional tarot decks upside down or reversed cards are considered to have either negative meaning or the opposite meaning of what the right side up card has. For the Mystic Visions Oracle Deck, upside down cards simply mean that this is a message you need to pay extra attention to. It is the universe’s way of getting your attention and making the importance of a specific topic known. It does not change the meaning of the card, it shines a brighter light on the message the card brings you, telling you that this is very important to your current situation at this time. Hello and thank you for purchasing the Mystic Visions Oracle Deck if you have done so already, if you have not, thank you for showing enough interest to keep reading all the way to the bottom of the page! Thank you again for your support of my work, please feel free to contact me if you have any questions about this deck, my artwork, or anything else you see here on my website.